Give Yourself Permission to Start Fresh Before the New Year. | The girl who loved to write about life. Give Yourself Permission to Start Fresh Before the New Year. You know when your house gets so messy, that it seems pointless to tidy up, because it really just needs a total overhaul? So you put off things like hanging up the laundry, because you need to clean your closet, and it doesn't make sense to add more clothes until you clean it...which, you have no idea when you'll actually get around to doing. Anyway, I think we treat life like that sometimes. We get to a point where there's so much we want to or need to change, that we just change nothing. We want to be healthier, but we refuse to so much as go for a walk until we've had a chance to construct an entire workout plan and spend $300 at Whole Foods on healthy groceries. We want to be more domestic, but we're going to keep ordering takeout until we get around to making a month-long meal plan. We want to spend more time bettering ourselves, but we're not going to so much as crack open a Bible until we've had a chance to look up a devotional and buy a book or two to read through. That's why New Years is so powerful. It offers a chance to look at every area of our lives, decide where we want to change, make meticulous lists and goals, and then overhaul our whole lives. And it's great! Having a brand new year can be the best motivation to make changes that we really do need to make. But also, give yourself permission to start fresh today. Before the new year. To make a change without the craziness of year-long goals and reevaluating every inch of your life. You can start fresh whenever you want to. New Years does hold a special kind of magic for starting over, but so do you. So don't live the next two months unhappy about something. If you don't like your life, change it. No matter what the calendar says. Do you find it easier to start fresh at New Years or on your own time? This post is great! You're so on point with the messy house and our lives lol. Little changes can help you reach your goals kjust as much as complete overhauls. I'm really bad at that whole "setting things up first" thing. I guess we all have the potential to be. So bad at the whole setting life up first before going for the goal. I'm giving myself permission to let go of that today! I have such a hard time with this too, so it's nice to know I'm not alone. I have a horrible habit of making soooo many to-do lists with the very best of intentions and then I inevitably lose the list or it becomes so overwhelming lol...here's to the New Year!!! I needed to hear this today FOR SURE!! I try to start fresh each week with a to-do list and/or goals for the week. It's nice to have a Monday to start fresh, but the start of a new month really inspires me more than anything. Never a bad time to start fresh I think! I started reading your post, the metaphor of the cleaning your house, and thought yep, that's why people love New Year's and then that was the point of your post. Haha! I think I love the certain hope and freshness of the New Year, the first page of a new notebook, a new planner. But I also do not believe on continuing to dig myself into pit to wait to a new year, the first page of a new note notebook, a new planner. So while those things give me some extra oompf, yes, I very much believe you can start fresh whenever you NEED to. And I have. agreed - new years is a great restart button! there are times when i feel like i have so many things in the house, that i am giving myself more stuff to do and clean by having more items. so about twice a year, winter and summer, i like to find time to purge some things that take up space. i find that doing it in smaller rounds, rather than one huge spring cleaning, i find it more manageable. plus, winter and summer are the only times i am slow enough to find the time! Yes to this! As much as new year's is a new start to many, it frustrates me that that is when people always choose to make resolutions. Every day you can make changes or start a new you. Waiting till January 1 just makes all those people who already went to the gym regularly really frustrated.... not that I'm one of those people, but still! Favorite line: "If you don't like your life, change it. No matter what the calendar says"
This is why I don't mind Mondays so much. I feel like I have a reset button every single week. I start over a LOT ...it's always nice to have a refreshed look on something. Love this! I find myself in complete overwhelm sometimes and it's really hard to crawl out. I usually deal with it by doing just what you said everyone does at New Years, making an incredibly detailed list and then going to town checking off the boxes. I've found that I'm much better at life management if I break some tasks down in to daily 20 minute bursts (like cleaning my apartment). 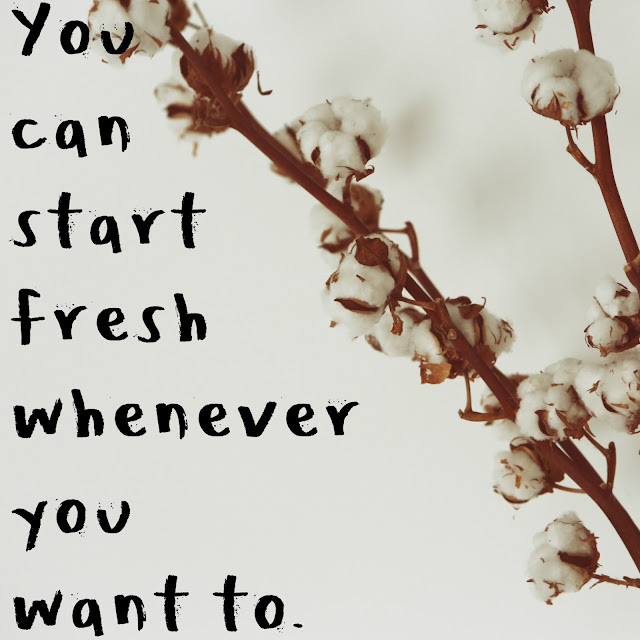 Hope you don't have anything that you feel like you need to start fresh! I love the idea of starting fresh over the new year, and I usually try to think of a few goals (without truly calling them resolutions) but to be honest, I do love just starting fresh whenever I want! :) I love starting fresh when a new season comes, or when a new school year starts…Goodness, sometimes I even consider every weekend a whole new start! And that's the beauty of life's journey - we can choose to have fresh starts whenever we need to! Thanks for this post and the reminder about starting fresh! I always think the beginning of a new month is a great time to start new goals - or even just tomorrow! There is no need to wait for an arbitrary day of the year. great advice to hear year round! i tend to get stuck in ruts and it's hard to get out of them until i really push myself. I'm one of those who thinks there are certain times to make changes. If I want to start something new (like I want to add a click to tweet link at the bottom of my posts) I always feel like I need to start on a Monday. So if I don't have enough time to prepare something for implementation over the weekend, but I have time Monday night, I still think I need to wait until the next Monday.